It took several days in Florida for the idea that I was pretty much surrounded by giant reptiles that could kill me to sink in to my brain. And, no, I am not referring to the Republican presidential candidates who were stumping through the state trying to gin up votes in the primary election which was scheduled for the last day of my trip to the Sunshine State. I am, of course, referring to Alligator mississippiensis, more commonly known as the American Alligator, or, colloquially, as gators. Alligators are capable of killing humans, but are generally wary enough not to see them as a potential prey. Mistaken identity leading to an attack is always possible, especially in or near murky waters. Alligators are often less aggressive towards humans than large crocodile species, a few of which (mainly the Nile and Saltwater Crocodiles) may prey on humans with some regularity. Alligator bites are serious injuries due to the reptile’s sheer bite force and risk of infection. 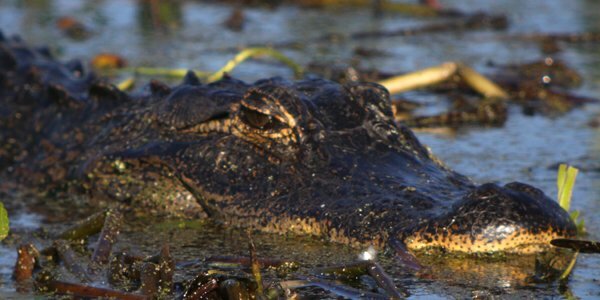 Even with medical treatment, an alligator bite may still result in a fatal infection. The alligator’s tail is a formidable weapon that can easily knock a person down and break their bones. 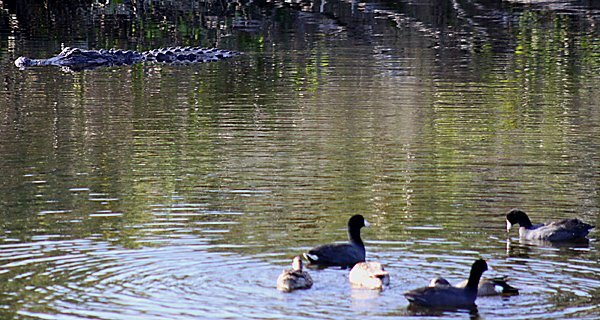 Alligators are protective parents who will protect their young by attacking anything that comes too close or poses threats to baby alligators. Since 1948, there have been more than 275 unprovoked attacks on humans in Florida, of which at least 17 resulted in death. There were only nine fatal attacks in the U.S. throughout the 70s, 80s, and 90s, but alligators killed 12 people from 2001 to 2007. In May 2006, alligators killed three Floridians in less than a week. Yikes! And alligators seem to be everywhere in Florida – basking in the sun, cruising through canals, eyeing your pet poodle. While they can be dangerous they are also incredibly cool and it was a joy to be able to see them in the wild (from a distance). And, for the record, I am not the first person to ponder birding where danger awaits on 10,000 Birds. When you’re birding somewhere that the birds try and kill you, then I’ll be impressed. Living in South Florida for over 5 years, I grew quite used to the gators. And becoming a birder for 3 of those years, the fear of them really subsided out in the field, but we knew to keep our distance. They usually just stayed where they were gonna stay, and we carried on as usual. 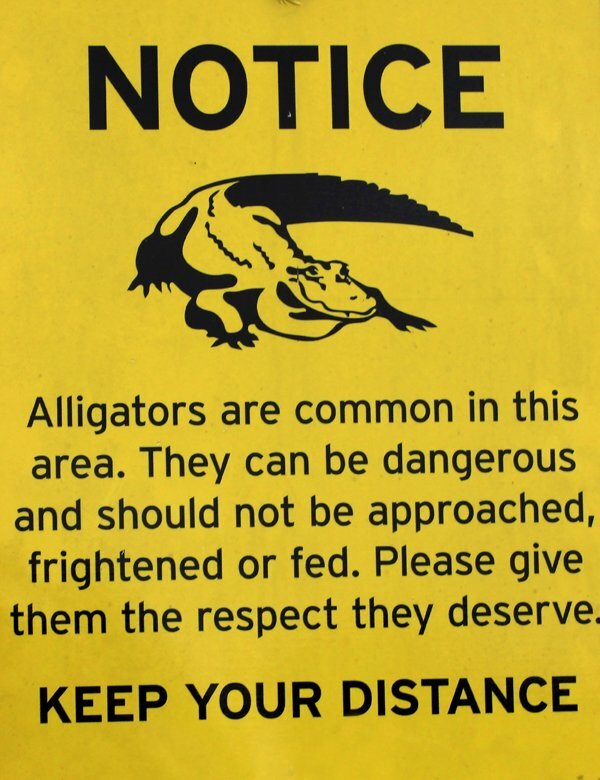 One of the times that I remember being pretty scared was in Shark Valley in the Everglades where the road you walk can be coated with gators. I remember having to walk about just 5 feet away from more than one to avoid them and carry on, and feeling relieved that I wasn’t attacked! And I kept waiting for the “National Geographic” scene to come where a gator would leap out of the water and attack a poor water bird. I’ve seen attempts but no successes. Glad you survived the Florida gators! If anything, alligators scare me more than bears. I don’t know anyone who has actually been eaten by a bear but my former boss’s father was eaten by an alligator in 2001. The awkward part was that when my boss told me why he was going to Florida and leaving me in charge, I thought he was kidding. Now wait a minute… Clare M blogging about birds and Corey about deadly dangerous critters? This is peculiar. The Lizard People must be behind this! @Carrie: the prospect of being ripped apart by a gator is more frightening than being ripped apart by a bear, but in the field gators are easier to avoid. Great post! I love alligators! 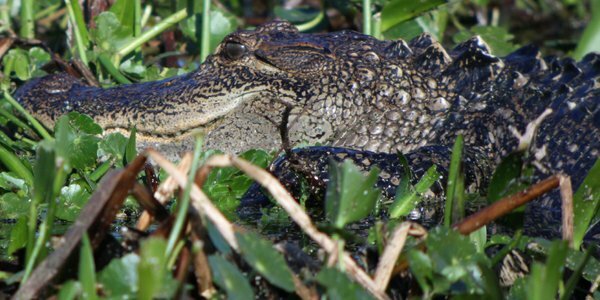 I have been working on a book about alligators for way too long, and one interesting bird-related thing about them is that their presence keeps raccoon and other small predator populations in check, which means fewer nest raiders for the wading birds. Although dangerous, they can be a bird’s best friend, as long as the bird doesn’t get too close! I love this post, Corey, and this thread — great comments. @Maureen, I can’t even imagine walking that alligator gauntlet, much as I admire and respect alligators. “A bite on the leg might be quite alligator, but gators are a bird’s best friend.” Thanks for the laughs.